In my last post I promised I would update you on how I was getting on with some other classes and workshops I'm doing or getting behind with. It is a very long post but please stick with it. Or just scroll down to the bottom for the announcement. Firstly One Little Word and Documented Life. I have been combining these and really not enjoying it. I haven't totally given myself to the Unplanner which has weekly art journaling type suggestions. I really only kept a 'diary' of what I had been doing. So as a result of Pathfinder - more on that later - I decided to discontinue the Unplanner in its previous form. I also decided not to continue with the I am tags. I decided to keep track of what I do each day on the calendar on the back of each monthly divider and concentrate on One Little Word. In April I went to Florida to attend a Ladies Getaway and I stuck the programme cover onto the April divider. I filled in a key activity from each day on the calendar. April's OLW task was to define what life was like with more of your word in it. I attended Pathfinder right at the end of April so I have only just completed this task. I was trying to exercise every day but that didn't always happen. 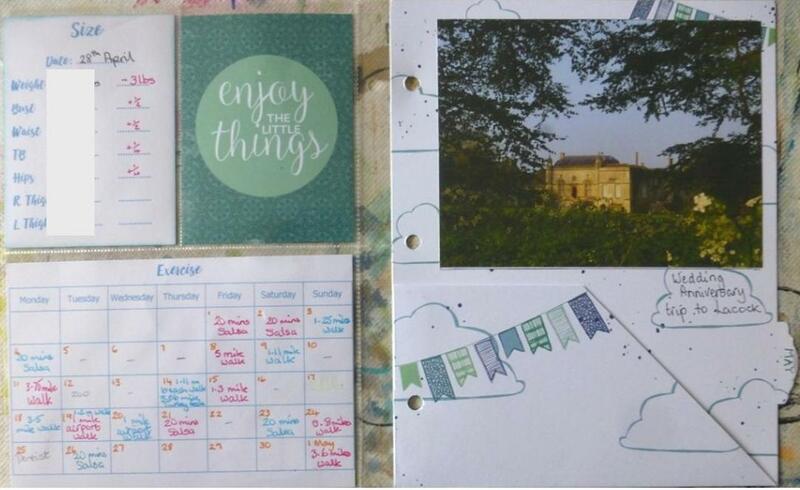 The photo on the May divider is of Lacock Abbey. We went to stay at a B&B in Lacock for our wedding anniversary. We didn't stay in the Abbey! However the B&B was absolutely five star. I signed up for an online class Art & Spirituality because it has been written by someone I know. It is excellent but requires a daily commitment each week. As we went away at the beginning of week 2 I got behind. Still I can keep all the PDFs and do the course when I have time. So on to Pathfinder. This was an excellent day with Anneliese Bates. I've done art workshops with Anneliese before but nothing like Pathfinder. She provided us with an A5 sketchbook and we coloured the backgrounds however we wanted and then she asked questions. The class was described thus: This workshop is aimed at anyone who doesn't know what direction they really want to take, whether you have a new business idea, thinking of a big life change, a change in career or even moving home, Anneliese will guide you through the thought process step by step, interspersing it with art for which you need no experience. 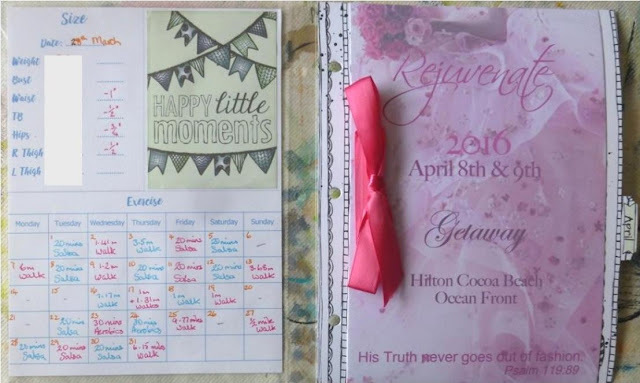 Included in the workshop is a journal that will be become your working thought process, beautifully decorated and personalised with your own artwork and full of your thoughts, dreams and how to make those become a reality. We will explore the changes you want to bring about, the things that are stopping you, and ways to overcome the obstacles. 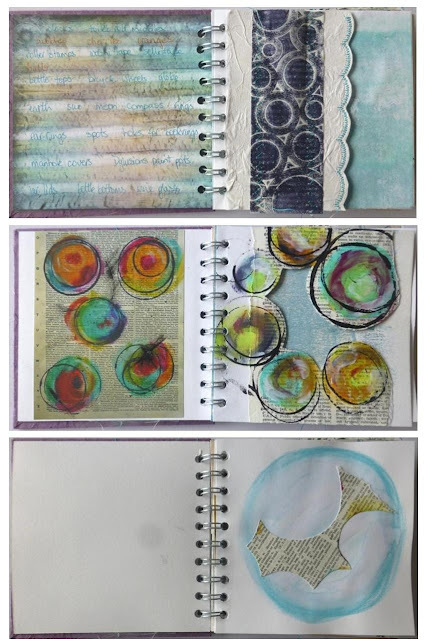 I had gone with the idea of looking at whether I should stick with art journaling or concentrate on textile art or do both. A somewhat simplistic idea in the light of what happened. The first question was what were you unhappy with in life at the moment and what did you want to change. I did add a couple of things to my answer. Anneliese continued to ask questions and we continued to write down our personal answers. The best part was as there weren't many of us that we were able to ask questions and make comments. Discussions ensued which helped clarify our thoughts. Here is a really key page. When I got home I wrote down all that I had signed up for! No wonder my head hurt holding all that information in my head. I went through the list and decided which ones I should stay committed to, which ones I should give up on entirely and those that I had online lifetime access to and could do when I have time. I have also withdrawn from the Cas Holmes weekend workshop. This was a really useful page that I did at home. Some of what is written here came out of the discussions we had on the day. However you know me, I ignored my own advice about not signing up for anything else and enrolled on a 9 weekend course called Experimental Textiles led by Kim Thittichai which starts in June! We had also talked about decluttering. We had loads of boxes of my Dad's stuff in the conservatory - they had been there 2-3 years. I had made a half-hearted effort to get them sold at an auction but had kept putting it off. We also had over 300 owls that Andy collected as a child and other collections of stuff. And stuff it is. However I emailed a different auction house who accepted everything I listed and we took it all to them - 18 boxes of stuff. They are sorting it into lots and it will all be put in an auction either in June or July. Result! I thought this was excellent from that article. I feel much more in control of what I am doing although there is still much to work through. Well done, if you're still here having waded through this post. And now for the big announcement. See you on Friday. Thanks for stopping by. I've been a bit busy! I did it again. I signed up for lots more classes. Not just online ones but some real life ones too. One of the online classes I signed up for was a short duration class with Dione Swift - Developing Sketchbooks - which was excellent. I wasn't thrilled with some of my pages but the techniques and principles apply to anything and I hope to get back to it sometime. I went to a 2 day class in Nailsworth, Gloucestershire taught by Kim Thittichai where we played with Lutradur, Tyvek, Bondaweb and polyester organza using irons and heatguns. There's nothing like a bit of bling! A 3D thing! It was supposed to be a bowl. And other exciting bits and pieces. 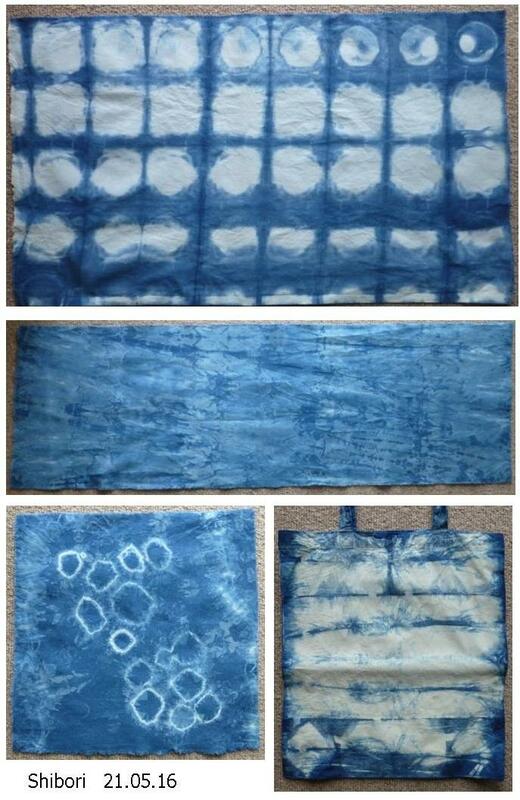 Last Saturday I went to a Shibori Indigo Dyeing workshop led by Liske and Claire at Littleheath Barn. We tried lots of different ways of tying the cloth and then dyeing them in the indigo dye. 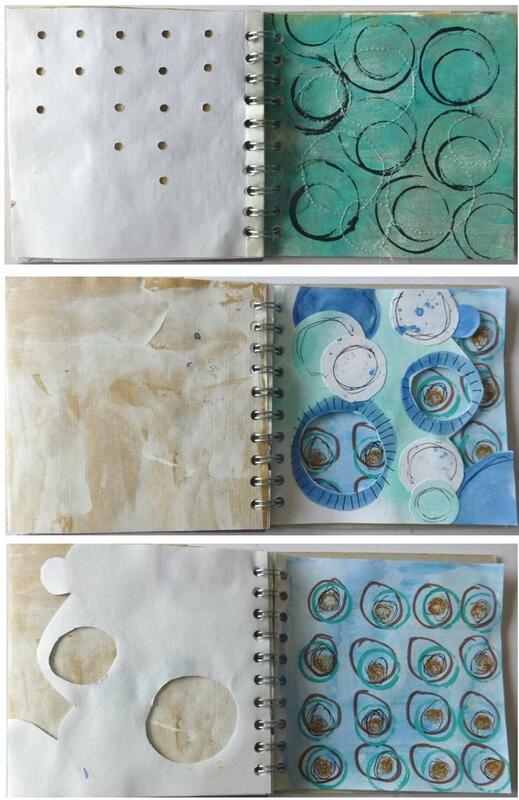 I have also been working on the art journal I'm making from Roben-Marie Smith's online class: Art-full Attache. I added the handles and stitched the signatures into the folder. I have started on filling the pages. I am going on a 3 day workshop with Hilary Beattie called Finding Sanctuary in July and I am using this Art-full Attache to collect together the photographs and ideas for the class. I'm also looking at colour schemes mostly in blue, sand and neutrals. I can't tell you whose photos have been used by Design Seeds as I can't find the information on their website. I had downloaded the colour charts from Pinterest. Hilary is repeating the Finding Sanctuary class in October at The Bramble Patch if you are interested. And there are some other classes I haven't mentioned One Little Word (I'm nearly 2 months behind! ), Art and Spirituality (3 weeks behind) and Pathfinder. Come back on Monday for those updates and a BIG ANNOUNCEMENT. In my journal I drew lightly with a pencil and then used a waterbrush and watercolour paints to colour the golden sceptre. I added the words with sticky letters. I had thought that I would paint the page gold to illustrate the glory of God behind the veil but decided to leave it as it was. I found a piece of paper the same size as the journal page and covered it in cling film and matt medium. I tore up pieces of violet, red and dark blue 'bleeding' tissue. This is special art tissue which bleeds when it is wet and I was hoping the colours would blend into each other - however the glue doesn't work like water does! When it was completely dry I peeled it off the cling film and tore it down the middle. I glued the pieces to my page. Today's post is about the wisdom of Solomon in 1 Kings 10. The next page in my journal already had this background on it so I went with it! At last I have started work on the Art-Full Attache class I told you about last month. The class is full of excellent how-to videos. I have done the front cover. I have done the first part of each set of pages to make 3 signatures. I used variegated thread and my new-to-me sewing machine although I don't think I've got the tension right. I used some of the gelli prints I made as part of the pages. There's lots more to do to these pages yet before I can start using the journal for the purpose I have in mind. Today's post is about David being drawn out of obscurity to be the King and that his inheritance will lead to the birth of Jesus. This page in my journal already had the background painted so I stencilled a tree onto it. I stuck the letters on for the words - insignificant and significant. I wrote the names - Jesse, David and Jesus on the branches. Thank you for reading my four posts about my holiday in Florida and Ohio. In November 2014 I met Mary for the first time in real life in Charleston, South Carolina and she gave me one of the altered book journals she makes from recycling old books. You can see them here on Found on Brighton. It's smaller than the size I would normally use and so I hadn't used it. Mary had used a copy of The Tale of Two Cities and it seemed the ideal choice to use as a travel journal for my trip to the two cities of Palm Bay and Toledo! I used some of the pages and papers Mary supplied. I also used some scrapbooking cardstock I had in my stash and some more we bought when we visited a great scrapbooking store in Sandusky. I've made a flip-through video of the finished journal. The journal got so thick that I put really large bookrings through it but they looked out of proportion with the book so I used twine instead. So as I said in my Last Days in Florida post, I flew to Detroit where Mary & her husband picked me and took me to their home in Toledo, Ohio. The next morning Mary and I took the scenic route through Elmore, Oak Harbor, Port Clinton,Lakeside, Marblehead Point, Sandusky and Huron to Beulah Beach where Mary had rented a cabin for us. This is Lakeside. There was also a village which had virtually no-one living it. It appears it's only a summer village. We drove on to Marblehead Point where this lighthouse was. And this is where the Lighthouse Keeper used to live. Lake Erie at Marblehead Point. Here's the cabin we stayed in. And this is the view from the front door. Mary spotted this eagle as we went out to dinner. This was the sunset when we got back. The next morning we went out to photograph the sunrise. Which was not as early as you might think. The heron flew away just as I got the focus sorted out so this is really blurred. Or will you accept 'soft focus'? I rather like the image, especially with the reflection in the water. After breakfast we spent a couple of hours crafting. I started on my travel journal which I finished when I got home. Later on our way to Sheldon's Marsh we spotted this traditional barn. At the Sheldon's Marsh State Nature Reserve we saw fish, birds and turtles. Later in the day we went to Milan - pronounced My-lan - which turned out to be the birthplace of Thomas Edison. There was a museum complex which wasn't open which meant we could wander around outside taking photos without people getting in the way. A little way down the road was Edison's birthplace. And right next door was the site of the Canal Basin but no-one is allowed to go past the sign. And this is all we could see of the basin! We went into the centre and wandered around the square. This is a very fancy library. This is an example of the street lamps. On Monday evening we went to Granny Joe's in Vermillion for dinner. Next morning the lake looked like this. I was so glad I had got up the day before for the sunrise. We visited Old Woman Creek, a National Estuarine Research Reserve. We came across this gorgeous barn as we walked around. And Mary spotted lots of birds and even I managed to get some photos. By the car park there were 3 benches with quotes on. I liked this one best. We then made our way back to Detroit Airport and I started my long journey home. Detroit to Orlando. Orlando to Dublin. Dublin to Birimingham. I have made a short video 'flip-through' of my US travel journal. Come back tomorrow to see it.